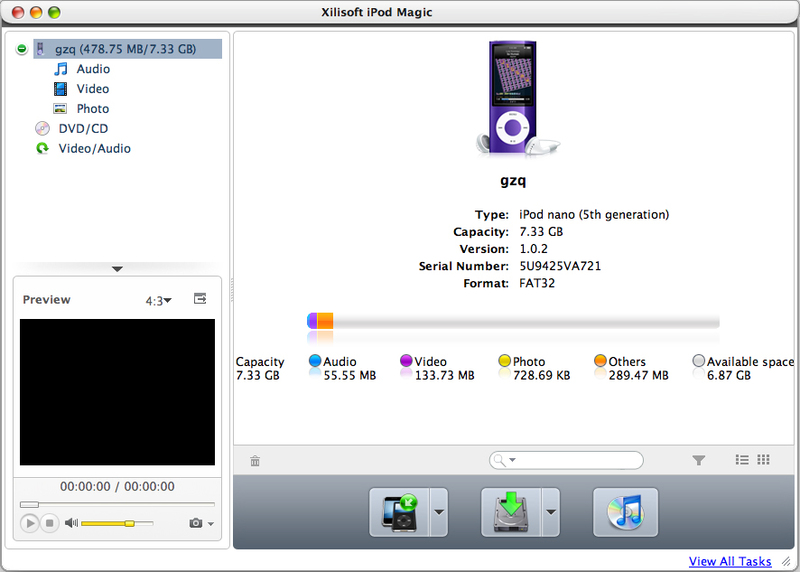 Xilisoft iPod Magic for Mac makes it easy to copy iPod files from iPod to Mac, Mac to iPod and iPod to iTunes. Not only can this Mac iPod ripper transfer iPod compatible files, but also it supports copying any incompatible DVD movies, videos and music to iPod as it can convert DVD/video/audio to iPod files. Transferring to multiple devices simultaneously is available. All these transfer functions are applicable to iPhone as well. * Copy music, videos and photos from iPod/iPhone to Mac, iPod/iPhone to iTunes. * Transfer iPod compatible files from Mac to iPod/iPhone. * Convert and copy DVD movie to iPod/iPhone. * Convert and transfer any video and music files to iPod/iPhone. * Prepare optimized video/audio profiles for converting to iPod files, and allow you to use custom profiles. * Transfer file among up to 26 iPods and one iPhone at the same time by drag and drop. * Make the files transferred to multiple iPods at the same time for saving time. * Support all iPod/iPhone types: iPod nano, iPod mini, iPod 4G, iPod nano 3, iPod classic, iPod touch, iPod shuffle, iPod shuffle2, iPhone, iPhone 3G, iPhone OS 3.0. * Recognize your iPod/iPhone automatically and show its device info. Qweas is providing links to Xilisoft iPod Magic for Mac 3.0.8.0629 as a courtesy, and makes no representations regarding Xilisoft iPod Magic for Mac or any other applications or any information related thereto. Any questions, complaints or claims regarding this application Xilisoft iPod Magic for Mac 3.0.8.0629 must be directed to the appropriate software vendor. You may click the publisher link of Xilisoft iPod Magic for Mac on the top of this page to get more details about the vendor.